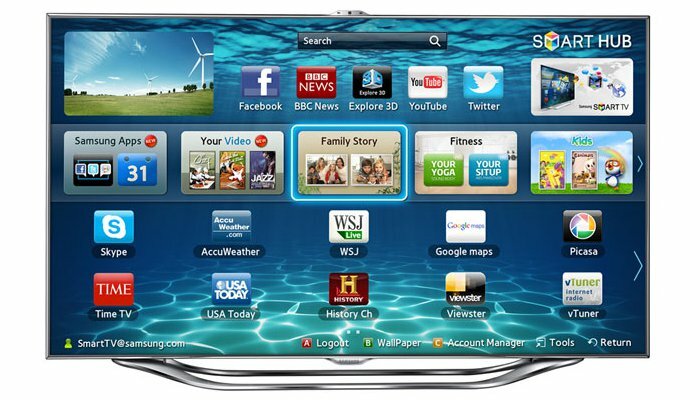 The Samsung ES8000 TV features built-in Wi-Fi to sync media with Samsung smartphones, cameras and other appliances. Samsung is bringing built-in Wi-Fi to many of its upcoming consumer products, creating an 'Internet of things' within its brand. New televisions, home appliances and other products will be launched this year with the ability to connect to users' wireless home networks. They can be controlled using Samsung-developed apps on smartphones and tablets, with some using SugarSync cloud storage to sync and share media files. For example, an owner of a new Samsung air conditioner will be able to adjust temperature settings while at home or out through a smartphone app, and any Samsung TV owner can view any recorded video content on a Samsung tablet wirelessly. Samsung already holds the largest share of the smart TV and refrigerator markets in Australia, and is experiencing rapid growth in smartphone and tablet sales: for the first time, it is the south-east Asian region’s number one brand in these areas. At its annual forum in Bangkok, Thailand last week, the company demonstrated several new products that will connect to users’ wireless networks to share information and provide remote control functions. Wi-Fi connectivity is central to the company's strategy for 2012 — not only for smartphones, tablets, cameras and televisions but also for home audio systems and home appliances like fridges, air conditioners and robotic vacuum cleaners. Samsung demonstrated a Wi-Fi fridge, Navibot vacuum cleaner, washing machine and air conditioner being controlled wirelessly through a Samsung tablet. This ‘Smart Control System’ service could be accessed locally or remotely through an Android app. An iOS app is also being developed. Samsung representatives also talked about possible future home appliance services using Wi-Fi, such as a user accessing the front-mounted camera of a Navibot vacuum cleaner, or a Wi-Fi fridge that could autonomously order groceries online. Another feature of Samsung’s inter-connected strategy is the wireless sharing of video, audio and photo content between all the company’s products. Called ‘AllShare Play’ (an expansion of last year’s AllShare), the soon-to-be-released service will let Samsung product owners share media over wireless networks (and 3G for 3G-enabled devices) through SugarSync’s cloud storage, with media available for download or streaming through any device running the SugarSync app. Compatible devices will include TVs, fridges, tablets and smartphones, although it is unknown exactly which products will be available in Australia. The service is designed to share content indiscriminately between a user's devices. The owner of a Samsung TV, Android smartphone or tablet, Samsung home audio system, and PC running SugarSync, for example, could access any synced files from any device, whether locally or remotely, on Wi-Fi or 3G. The wireless connectivity also extends to Samsung's new range of compact cameras. All will be able to be controlled remotely through a 'viewfinder' app, and will be able to upload files to a SugarSync cloud account. A future upgrade for the NX range of interchangeable lens cameras is also a possibility. The company’s focus on convergence and wireless sharing should be a drawcard for buyers who already own a compatible smartphone or tablet, or who are already familiar with cloud storage. Further details on Australian pricing and availability of Samsung’s 2012 product range will come in April. Campbell Simpson traveled to Thailand as a guest of Samsung Electronics Australia.